Millcreek Herbs LLC - Herb Articles - Healthcare: Garlic - Dedicated to the understanding, wise use and enjoyment of herbs. Merry's articles and herbs research will help you to learn more about medicinal herbs, culinary herbs and the wellness benefits of Complimentary Alternative Medicine (CAM). I have heard that garlic can help to lower my high cholesterol levels. I'd rather not eat it raw, so I went to buy some capsules in the health food store and became confused because there are so many products to choose from. Can you set me straight on how to includes garlic in my diet, and also tell me what it is good for? Clinical studies have shown that garlic can help to lower LDL-cholesterol ("the bad kind") while helping to increase HDL-cholesterol ("the good kind"). I have read some of these studies and though the results are positive, they are not dramatic. My suggestion is go ahead and includes garlic in your diet, but see it as a supportive measure. It would be reasonable to use garlic consistently if you have a family history of high cholesterol. As always, be sure to let your doctor know that you are using herbs. In terms of dosage, the equivalent of three cloves a day is recommended. The most economical way to go is to use the fresh plant, but the flavor can be harsh and cooking it for more than 10 minutes reduces the potency. You could also make capsules of dried, ground garlic that has retained its plant oils. As for preparations on the store shelf, you're right, there are many to choose from. A daily dose, when standardized, should guarantee 8 mg of alliin, which is believed to be the beneficial constituent of the plant. The reason we smell like garlic after we have consumed it is because it gets excreted through the lungs and skin. If it is important to you that you not smell like you have eaten garlic, there are enteric coated garlic pills that break down lower in the digestive tract. As often happens with herbs, they get pigeonholed for one particular use, but garlic has many applications. It helps to relieve congestion from a cold. It encourages sweating. 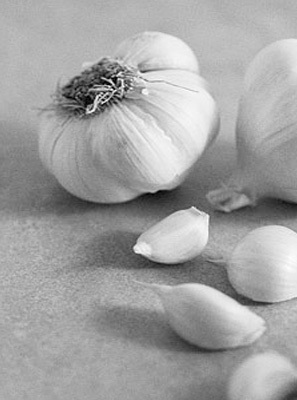 Garlic is one of the few herbal antivirals, and it's also antimicrobial, so it will inhibit bugs inside and out. Whether you have an infection, a fungus on your skin, Montezuma's revenge or an overgrowth of yeast, garlic may be useful. Garlic can be used continuously for several weeks for chronic conditions. For those of you who say you don't like garlic, don't use it. All herbs are not for everyone. If you find garlic disagreeable, there is no reason to force it. Eat one clove a day to help repel mosquitoes. Feed it to dogs to repel fleas. Garlic oil in a child's sore ear may help to clear infection.